Every New Year presents everyone with the opportunity to start anew. 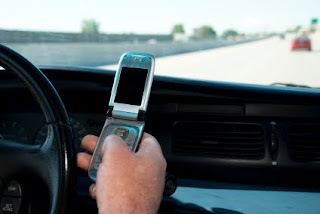 Were you one of those who secretly texted while driving in 2010? Do you feel like the perfect way to change that is this time of year? AT&T started a campaign to combat texting while driving way back in March of 2010, and the 10-minute documentary that they produced in the last week of 2010 really makes everyone just stop and think (AT&T Txting & Driving Campaign). Is one last text worth it? Here are a few steps anyone could follow in order to make sure that resolution makes a lasting change --- and sticks. It might also help encourage others into doing the same. State a clear intention/goal for the year – It could be a simple phrase or a simple statement like "I’ll keep the phone in the glove box before even starting the car and pull it out when the engine is completely stopped," or "no texting while driving." Write it down in a note then put it up on the fridge. Or simply repeat the statement when you're in the driver's seat. This helps anchor that idea into how you perform your day-to-day routines. Consider the next actions you take with this goal – Okay, now that you have a phrase you could repeat, actually DO the action every time. Feel it out for the next few weeks --- are you noticing more and more things that are actually happening on the road? What would be your next course of action? Now that you've eliminated one distraction from driving (the texting), why not find more ways you could remove several other distractions? Take a look back – Just to keep track of your progress, are you still itching to check your phone during a red light? Were you successful when you fought that urge? Or maybe you have stopped wondering about your phone while driving --- are people who ride your now-safe vehicle taking notice? Looking back helps you realize how far you’ve gone --- and may also point out areas of improvement, like putting the phone on silent, to lessen the urge of checking it, perhaps. This could be a monthly check if you’re reciting your intention every time you start the vehicle, or maybe you’ll notice that you can’t start the vehicle without making sure the phone belongs to where it is safe --- far from you, while driving. Reach out to like-minded revolutionists – It can be a conversation among friends, or start the resolution with people in your family --- to help you enforce the rule and keep track of each other's progress. Ask them to point out when you look like you're tempted to check when they are riding with you. Help each other. Be realistic and be kind – Most New Year's resolutions fail because people look back and wonder why nothing's changed when they have exerted nothing to get to that realistic goal. Be kind to yourself, when it comes to a resolution about texting while driving, the time could be the first week of January, or the third week of July --- it is never too late to start this resolution. To help with this New Year's Resolution learn more about the measures taken to stop distracted driving and the distracted driving campaigns.